In a Strange Land: Brand Confusion at Linden Lab? As I consider the range of ads that Linden Lab has run lately, I wonder exactly what type of user the Lab wants. Hamlet Au has championed growing SL's population by making boundaries more transparency between real-life and avatar identities. He's done so in a number of posts (here's the latest one) about linking social-networking sites to avatars. I'm not opposed to that idea, though I like the notion of letting SL residents opt out of such conflation of realities. At the same time, I wonder if Linden Lab has thought through the rhetorical implications of a few of their advertisements. Consider these images: These white heterosexual couples are moving into their Linden-supplied dream homes or finding "a place to love," a term used in a few places by the Lab. If these handsome folks are not married to each other in real life, they are at least ready to hook up in their second ones and perhaps have kids, as in this one that Linden Lab pulled after catching a lot of grief about the appearance of a virtual child. Except for the last one, these images lend credence to the portrayal of SL as a meat-market, one that James Howard Kunstler used in his recent podcast about virtual experiences vs. real ones. And at the video Linden Lab links under "about Second Life" you will see token tinies and furries and robots only in the closing scene. The black male avatar is carefully depicted as a business man in suit and toting a briefcase: Obama with the nuclear "football," perhaps? She's a lovely woman in both real and Second life. This campaign, one that includes at least one image of a person becoming a nonhuman avatar, seems to match what Hamlet is calling for at New World Notes. It's not unusual for a company to appeal to two very different sorts of users; General Motors does not use the same appeals when selling an Impala, a GM pickup, and a Corvette. But GM is selling us products based upon an established brand identity in the marketplace. Linden Lab provides a service that most folks I know have never considered necessary to their lives, even if they have heard of a "virtual world." Despite my Peak Oil beliefs, I'd challenge you to find many Americans who don't know what GM is, let alone argue that the automobile is not necessary to how most of us live. Linden Lab has to figure out what its place in the social-networking / gaming world is: GM could, for a while anyway, afford to be something different to everyone. A small firm like LL needs focus, and I'm not seeing that in their current advertisements. Second Life® and Linden Lab® are trademarks or registered trademarks of Linden Research, Inc. All rights reserved. No infringement is intended. Satire is another matter. 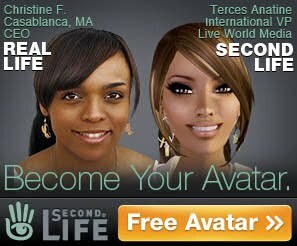 You mention connections between social networking and Second Life. You say that you'd hope LL would allow us to opt out. I respectfully suggest this is the wrong approach from the start. The cardinal rule of social applications is OPT IN, not OPT OUT. We should never have to UNDO something that they want to change. If we want to be involved, make it easy to subscribe, but let that freedom stay with us. Also, with the ongoing debacle with Facebook at the moment, I not willing to share much private (read: real world) information at the moment. What AJ said! I meant that I didn't want the default to be "you are now a social network member." We should, as AJ notes, have to opt in. My point was that LL should not automatically assume all avatars want to be part of a social network as well. I don't have time for Facebook or other social media beyond what I now do, anyway. My profile would be a vast wasteland. I think I check my Linkedin profile about 2x a year.